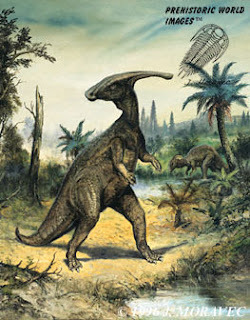 Dinosaur Corporation: Parasaurolophus walkeri - Duckbilled and Awesome! This Parasaurolophus walkeri print is an art picture of one of the most well known dinosaurs, the crested hadrosaurid, a duck-billed dinosaur, in its natural environment. This is the reprint of the original oil painting by Josef Moravec, a renowned paleo-artist. The name Parasaurolophus means "near crested lizard" referring to the long, hollow crest protruding from the top of the head. It is named in honor of Sir Byron Edmund Walker, Chairman of the Board of Trustees of the Royal Ontario Museum, where the bones of the incomplete specimen are currently stored. It was about 10 m (33 feet) long, and weighed about 2.5 tons. Just the head together with the crest was about 1.5 m (5 feet) long. It was bipedal and quadripedal, and had unusually strong front and hind legs compared to other hadrosaurids. Probably it walked on all four limbs when grazing for food, and was running only on two hind limbs. Since it did not have any structures that could be used for protection against predator, it had to rely on the strength of its hind legs to outrun predators. The fossil remains of P. walkeri were discovered in the Dinosaur Provincial Park in southern Alberta, Canada in 1920. The dinosaur lived some 75-76 million years ago, in the late Cretaceous period, and until today its fossil remains stay very rare. It had hundreds of teeth packed in sets, of which only a few were used at a time for grinding the food. As the front ones were worn-out, the new ones pushing from the back replaced them. Based on markings on teeth, it is believed that it grazed on horsetails and other vegetation close to the ground, and sporadically consumed branches and other more robust plant material. This Parasaurolophus walkeri print shows its most noticeable characteristic, the large cranial crest projecting from the head upwards and back, whose function is still not clearly understood, though many theories have been proposed. The crest was hollow, with complex structure of chambers. There were many hypotheses about the role of the crest, from being used as a snorkel to a weapon, most of which have been dismissed. A computer simulation of air passing through the complex internal passages of the crest showed that it could produce sounds of certain frequencies, probably varying in each individual. This was important for communication with other members of the herd, either between an adult and a young one, or between adults when, for example, mating or alerting each other about the presence of predators, because like most plant eaters, it likely lived its life as a member of a herd. Likely being a cold-blooded animal that could not regulate its body temperature (although scientists are recently rethinking this postulation), the crest may have been important in the thermoregulation of the body. Due to its size it could had been used for cooling of brain, or for accumulation of heat during the day which would then be released during the night to keep the body temperature constant. And finally, as a sexual dimorphic characteristic, the crest with its markings was important in recognition of species and sexes.